Originally, we all logged on to social media to be closer with friends and family members. As time went on, however, our so-called "friends" and "followers" lists grew to include casual acquaintances, coworkers, and old classmates. After all, it'd be rude to ignore a request from your second-cousin, Dan, or your coworker's wife, Lesley. Right? As our follower list grows, our privacy seems to dwindle. Heck, maybe you don't want everyone you've ever chatted with at a party to have access to everything you post. Maybe you prefer that some things (like pictures of your kids, videos of yourself venting about work, or photos from a raucous night out) stay among friends. As a result, Instagram's users have long relied secondary, more intimately curated personal accounts to communicate with their inner circle. However, with the introduction of the Facebook-owned company's latest feature, these so-called "finstagrams" may become a thing of the past. Instagram is now making it possible to limit which followers see your Stories with the introduction of "Close Friends" lists. That's good news for those who want to make their IG Stories a bit more exclusive. Creating your Close Friends list is simple. Just tap "Profile" in the side menu, and select "Close Friends." Here, you can scroll through your followers list or use the search bar, and select those you want to add to your inner circle. Note that users cannot request to be added to your list. Your decision on who deserves that "Close Friend" designation is entirely up to you. And, if you're worried that someone will feel left out if you choose not not include them on your Close Friends list, never fear. Instagram's newest feature is discreet. 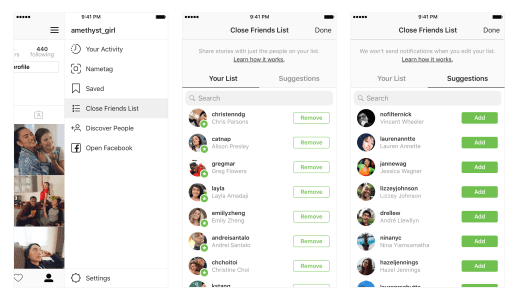 You can update your Close Friends list at any time, and no one is notified when they are added or removed. When you go to post a Story, you'll see a new option to share it with only those on your Close Friends list. Once it's posted, those users on your list will see a green ring around your profile photo in the Stories tray, which indicates that the story was shared with them as a Close Friend. If you choose to share a Story with all your followers, your photo will appear to everyone–including your Close Friends–with a pink ring. In the age of social media, the line between friend and follower has been blurred, but Instagram's latest feature seeks to redraw that boundary. Just like in the real-world, you'll now have more control over the people with whom you share your more private moments. An Entrepreneur since before the average person knew what that even meant. Mike spends his days running digital across the United States for Michaels Wilder, a full-service marketing agency with a flair for creative. Hey Buddy!, I found this information for you: "Instagram Now Lets You Privately Share Stories With Your “Close Friends”". Here is the website link: https://mikespeer.com/instagram-close-friends/. Thank you.